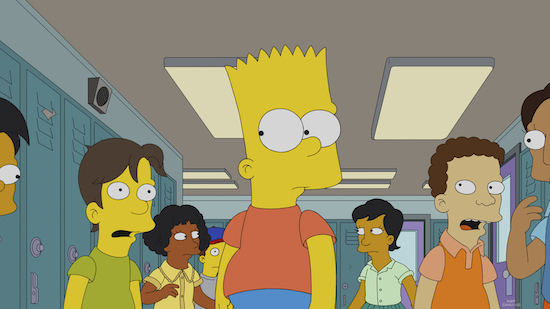 In “Bart’s Not Dead,” Bart winds up in the hospital after a dare goes awry. But when his fib about going to Heaven gets attention, the family is offered a movie deal. Check out photos from THE SIMPSONS’ season 30 premiere! HE SIMPSONS: Bart takes a dare, and ends up in the hospital. To cover for himself and Homer, he says he went to Heaven and met Jesus. Christian producers offer the Simpsons a movie deal, which Homer takes. But Bart can’t deal with the guilt and comes clean to Marge after the movie is finished in the all-new “Bart’s Not Dead” episode of THE SIMPSONS airing Sunday, Sept. 30, (8:00-8:30 PM ET/PT). THE SIMPSONS ™ and © 2018 TCFFC ALL RIGHTS RESERVED.